The opening verse of this Psalm appears to attribute it both to the sons (or descendants) of Korah – who authored numerous chapters of Tehillim – as well as to a man named Heman Ha'ezrahi. 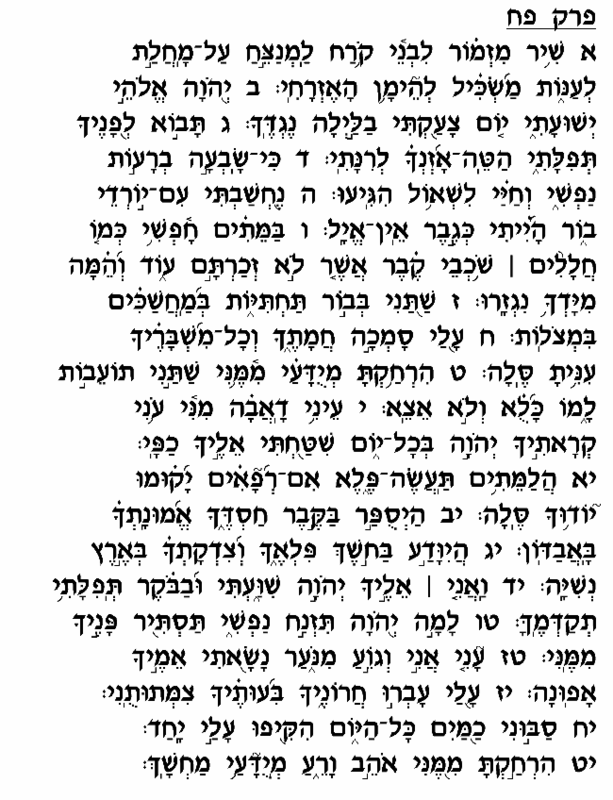 Rashi explains that the sons of Korah composed this prayer with the intention that it be sung by Heman Ha'ezrahi. Heman is identified in the Book of Divre Hayamim I (2:6) as a descendant of Yehuda's son Zerah, thus accounting for his name "Ha'ezrahi" ("Ezrahi" from the name "Zerah"). He is also listed in the Book of Melachim I (5:11) among the wise scholars that lived during the time of King Shelomo. However, if Heman is indeed a member of the tribe of Yehuda, it seems difficult to explain why he would be chosen to sing this Psalm in the Mikdash – a task that was assigned to the Levi'im (members of the tribe of Levi). For this reason, perhaps, the Radak maintained that to the contrary, it was Heman who composed this Psalm and gave it to the sons of Korah – who were Levi'im – who sang it in the Mikdash. In any event, this Psalm is an impassioned plea for assistance during a time of dire straits. The author emphasizes a number of points in particular, including how close he is to death, and how he has been abandoned by his comrades. In verses 4-8, he claims that he is already treated as though he were dead, noting that people already speak of him as deceased. He further describes the "depths" and "darkness" in which he lives, practically on the brink of the grave. In verses 9 and 19, he laments the fact that his former supporters now look upon him with contempt and keep their distance from him, leaving him to wallow and wither in isolation. He is left with only the Almighty to whom to look for hope and support – which he does by articulating this prayer. Rashi and the Radak explain this chapter as a reference to the suffering in exile, when the Jewish nation as a people reached the point of nearly disappearing from human history. Indeed, many times throughout this tumultuous exile Am Yisrael was spoken of in the past tense, as though it had already perished – just as described here in this Psalm. The sense of abandonment depicted in this chapter refers, according to Rashi (verse 9), to the other nations' disregard and contempt for the Jews during the exile, and how the Jews were betrayed by the nations who had previously offered friendship and support. According to the Radak (verse 9), the Psalmist speaks here of the efforts each individual Jew had to make to ensure his own survival, which precluded the possibility of people assisting one another. The harsh conditions of exile required people to ignore the plight of their fellow Jews, due to their preoccupation with personal survival. 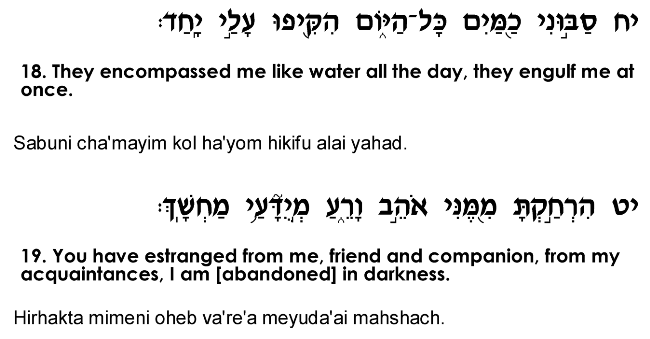 Ibn Ezra adopts an entirely different approach in explaining this prayer, claiming that it refers to illness. The author's condition has deteriorated to the point of near death, and even his closest friends refuse to visit him because of their fear of contracting the illness. This Psalm thus expresses the belief in God's ability to bring a cure even at the brink of death, in the spirit of the Talmud's famous and timeless adage, "Even if a sharp sword is placed upon a person's neck, he should not hold back from begging for compassion" (Masechet Berachot 10a).